Enchanted revolves around Princess Giselle (Amy Adams) who lives in a perfect world of fairy tales where happy endings happen all the time and animals can talk, sing and dance. It's truly the perfect world and a world that is reminiscent of many Disney stories. In the Kingdom, Giselle has finally met prince charming, the handsome Prince Edward (James Marsden) who seems to be her soul mate, however for Queen Narissa (Susan Sarandon), she sees this love as a curse against rulings and plots to dispose of Giselle. Pushing Giselle down a wishing well, she leaves her nursery book world and wakes up in New York City, a world that she never knew existed that is filled with crime and grim realities. Wandering the streets, looking for a way home, she is eventually taken in by a man and his daughter who teach her how to live in the real world. The story is your classic fairy tale romance with a twist and match that with a truly enjoyable soundtrack, Enchanted is one movie that comes highly recommended. It has all the ingredients of an excellent Walt Disney movie. 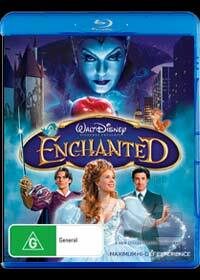 The video quality of Enchanted is presented in 1080p HD Widescreen and is extremely "animated" and colourful with exceptionally bright colours and a smooth contrast. It has a surreal, almost animated feel to the movie with rich colours and extremely sharp picture quality. As with the video, the audio quality features DTS-HD 5.1 that sounds phenomenal and really makes good use of the surround sound features, especially the musical part in the park, simply music to the ears. The extras of Enchanted are a little lacking but the Deleted Scenes and Bloopers were quite entertaining as was the pop-up storybook option that kids will enjoy, add in the Carrie Underwood music video and fans of the movie will be extras paradise. In conclusion, Enchanted is a movie that can be watched by anyone but the true fans of the movie will be girls who will simply adore the storyline.